I’m just going to say this because I know I’m not the only one out there thinking it: How on earth did Thanksgiving 2016 get here so fast!?!?! Maybe it’s the unseasonable warmth that has blanketed 2016 in complacency or perhaps we’ve all been a little too disconnected from reality thanks to a blistering Presidential campaign and (for some) election. Whatever the reason, we are very much overdue for a day of gratitude and giving thanks. Before then, Turkey Trots had never really occurred to me. I just sort of thought everything was closed on a major holiday and that people were either out of town or they were at home, already cooking, and too busy to get out of the house for a run. I’m so glad my friends suggested that I run with them, because now I can’t imagine my Thanksgiving Day without a Turkey Trot! Chief among the reasons you should consider adding a turkey trot to your holiday is that you get some quality exercise before you consume twice your daily, non-holiday intake of food. Your energy goes through the roof before the triptophan sinks your buzz, and you get to enjoy a few hours of a flat stomach before all the food bloat (sorry, that seems petty). Also, most importantly, Turkey Trots are a great way to give back to your community or to those who are not as fortunate to have a Thanksgiving Day feast. Most events that have registration fees donate a portion, if not all, race entry fees to a local food bank, a homeless shelter, or to provide for anyone who is simply in need. It’s awesome to see so many people come together in an era of such divisiveness to help others. Also, as a runner, starting off the day with doing something that has enriched my life so much is also a great way to get my mind right for a day of giving thanks. My 30’s, so far, haven’t been the easiest years of my life, but I am grateful every time I step out the door that I have running to get me through it. More than likely, this is the one I will be running this year. Race Start Location: Homes for America (318 6th Street in Eastport). Cost: There is no registration fee, but donations are accepted and appreciated. Race Details: Kids, dogs, and strollers are welcome. Also, there are prizes for the best costume. Click here for more race info. My first runner’s-up in case Annapolis falls through. Race Details: Timed course with free photos from Swim Bike Run Photography. Click here for more race info. My friend Kristine and me before the S.O.M.E 5K, Thanksgiving Day 2014. I have run this race twice before, and it’s a great one! Very widely-attended. Race Details: Timed and untimed race starts. Click here for more race info. This one used to run past my house. It gets bigger every year! Race Details: Kid-friendly, dog-friendly timed course. Costumes encouraged. Click here for more information! Race Details: Prizes for top finishers. Click here for more information on the race. For those who really need something to brag about at dinner (2016 has been tough, I get it). Race Details: Prizes for top finishers. Not dog, roller blade, or stroller-friendly. Click here for more! Now, to be fair, I haven’t ever worn a costume for a Turkey Trot, but I plan to this year. I applaud people who can be a little silly and get into the holiday spirit, and it’s ridiculously easy. Even if you’re not decked out in a full-fledged head-to-toe costume. Plus, Thanksgiving is ripe for group costume fun. Anyone who wants to go in on a group Thanksgiving dinner costume, my email is under the Contact Me page. I’ll be waiting. For some great tutorials on DIY turkey costumes, check out this Pinterest page. You could also throw on an actual turkey costume, like this fleece bodysuit ($28.39-59.95, Amazon.com), or this cooked turkey costume is hysterical ($60, Walmart.com). If, for safety reasons, your race doesn’t allow for costumes that are so concealing, this turkey costume with a headpiece is a great alternative ($72, Amazon.com). There are also great hats for anyone who doesn’t want to brave wearing a full-on costume, like this pumpkin pie hat ($9, PartyCheap.com) or a cooked turkey hat ($15, PartyCity.com). Also, who never said that Christmas-themed costumes were a no-go at Thanksgiving Day celebrations? Other ideas: Have a friend dress as a turkey and you dress as a pilgrim hunter, and chase each other during the race. You can also dress up as a Thanksgiving Day table, the Mayflower and Plymouth Rock, or pumpkin pie and whipped cream using some cardboard and other craft supplies. Also, if you are super elaborate and creative, what about dressing as a TV with the football game going? And don’t forget the many ideas that are the sides: mashed potatoes with butter and gravy, a bowl of cranberries, or corn. Oh, the ideas. Turkey Trots are also a lot of fun when you have family challenges. Say, whoever comes in first gets to carve the turkey. Whoever comes in last gets to do the dishes. The first kid to finish gets to pick the after-dinner movie or board game. All in good fun, of course. However you decide to get in your run this Thanksgiving, here’s wishing you and yours a blessed day and a warm and merry holiday season! 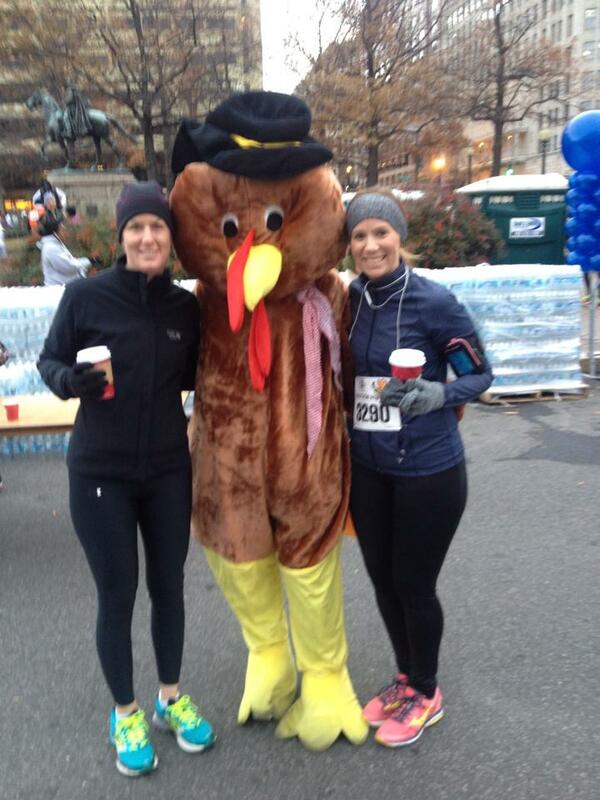 I keep going back and forth about running a turkey trot! Do I run near my home, or near my parent’s where I’ll be eating dinner? I have a 5K on my training plan – it would be prefect timing… what to do, what to do! I love your challenge ideas! Haha, that is my dilemma this year, too! I have a friend in Annapolis, which is why I may run that one this year, but will be having dinner back in Arlington. Hope you have a great run and Thanksgiving celebration! I love Turkey Trotting. 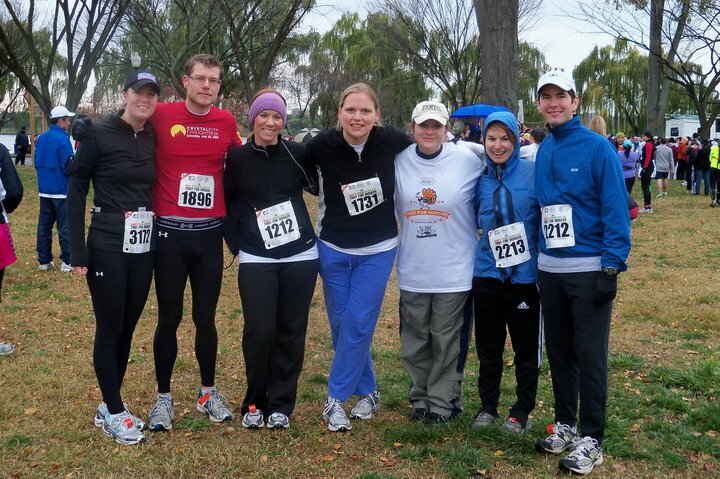 I am a creature of habit and have run the same Turkey Trot every year since 2006. I am going to keep the tradition alive at the VA Run Turkey Trot in Centreville.